I’ve got another guest post up at the practicalities of elimination communication. I have a stack of old T-shirts in my fabric box waiting to be turned into baby shirts (ones that are no longer fit for adult use but have enough good fabric in them to be worth chopping up), and this week made my first attempt, with an old Belle and Sebastian shirt. Lots of pictures after the cut. Lousy weather notwithstanding, I am soldiering onwards with planting in the back garden. (And, indeed, some things are even growing.) 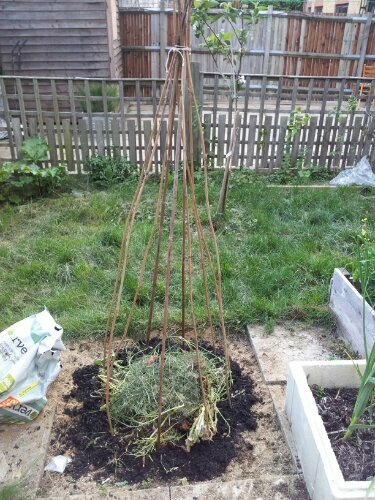 This week, it was time to establish the new bean wigwam. First job was to prise up some more paving slabs, as this is an area I haven’t used before. Next, to shove a few bamboo canes firmly into the ground and tie them together. Here it is, modelled by my glamorous and somewhat grubby assistants Leon and Sidney. Paving slabs up, sticks in, lots of sand (underneath which is London clay). The other beds are all standard raised beds (made from pallets), but this time I haven’t had a chance to build a proper bed. So for now I’m just piling compost around the poles and planting into that. Leon helped me to trowel compost out of the bag and spread it in a circle. Finally, after Leon was in bed (so I wouldn’t have to hoick him out of the compost heap), I dug a few spadefuls of not-yet-composted material out of the compost heap, and piled that in the middle of the wigwam. 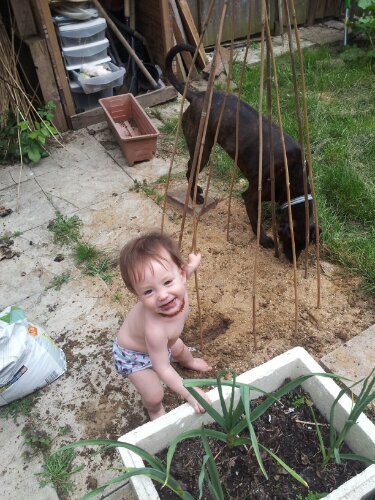 (Ideally I’d have done this before setting up the poles, but baby and dog assistance precluded.) The idea is that the beans will surround this pile as it composts down, creating new soil in the middle of the bed. Once the beans are done for the year I can also chop those off at the base, leaving their roots in place to help improve the ground, and pile the rest of the dead bean plants in over the compost to rot down further over the winter. This bed only gets sun during the summer so won’t be in use in winter anyway. French bean seeds planted around the poles, and I was all done. I wouldn’t go so far as to say I’m expert at sleeper train travel with a 1 year old, but in the past 6 months we’ve taken 3 sleeper train journeys and 1 overnight ferry, so here’s the quick run-down on experiences so far. Aberdeen-London, Scotrail single berth compartment: narrow berth, not really enough room for adult + baby (Leon was 9 months at the time). But the bottom bunk is flat and has no gap down the back, so I wasn’t worried about safety. The two-berth compartments are the same style. London-Venice, Thello, six-berth compartment: this was not the intended mode of transport, but the carriage containing our intended two-berth compartment was broken. (Even more broken, we assume, than the replacement, which is impressive.) The six-berth style compartment we actually travelled in (thankfully not sharing with anyone else, for which I was especially grateful when Leon started to throw up at 3am) had very narrow berths, and the bottom berth was heavily sloped towards the wall, with a small gap between the bottom of the seat back and the bed. I was concerned that it wouldn’t be very safe to sleep with Leon between me and the wall, and it certainly wouldn’t be comfy, so wound up sleeping head-to-tail (until 3am, anyway, when the sleeping stopped). With a younger baby I think I’d have just sat up for the night. I would not recommend this with a baby not old enough to sleep on their own. The four-berth is also this style. Venice-London, Thello, two-berth compartment. This was much nicer. Bottom bunk was flat, very wide (for a sleeper train; I think 2’6), and had no gap at the back. Lots of room for me and Leon both to lie down comfortably. Would happily do this again, other than the bit where it took him an hour to settle. The three-berth compartments are the same style. Liverpool-Belfast, overnight ferry, two-bed cabin. Very comfy. Standard size single beds with a rail at the edge (though I still kept Leon on the wall side) and no gap by the wall. Would very happily travel like this again (and indeed I imagine we will, this summer). The Waste Land For Babies! Anyway, this post is not to talk about lovely Venice, but to say, if you didn’t already know, that Marna’s fabulous Kickstarter, The Waste Land For Babies (picture book edition), ends tomorrow, so pledge your pennies now! Leon got the laminated original version for his Christmas so I am confident in declaring its awesomeness. Click! Love! Back! And, in due course, read and adore.